SINGAPORE/SYDNEY (Aug 27): The yen nursed losses against the dollar on Thursday as gains in Chinese equities helped underpin risk sentiment for now and dampened demand for the safe haven Japanese currency. Comments from an influential Federal Reserve official on Wednesday downplaying prospects of a September interest rate hike helped improve market sentiment. In the currency market, investors reacted by unwinding recent moves that lifted both the yen and the euro. A recent rise in risk aversion had triggered short-covering in the yen and the euro, which are popular funding currencies for carry trades. Such trades involve selling low-yielding currencies to fund investment in higher-yielding currencies and assets. Such demand for the yen and the euro showed signs of ebbing, however, helped by a bounce in global equities after their steep recent selloff. Asian equities rose and Shanghai stocks edged up 1.6% after Wall Street posted its biggest one-day gain in four years on Wednesday. 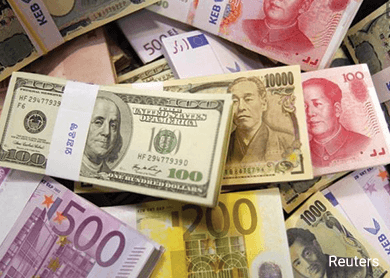 "The yen, euro and Swiss franc are funding currencies ... and so when things calm down, dollar/yen can rise and the euro can slip against the dollar," said Satoshi Okagawa, senior global markets analyst for Sumitomo Mitsui Banking Corp in Singapore. The dollar edged up 0.1% to 120.03 yen in the wake of its 0.9% gain on Wednesday. The dollar had set a seven-month low of 116.15 yen earlier in the week. The euro rose 0.3% to $1.1353, still nursing heavy losses from Wednesday, when it slid around 1.7% and pulled away from a seven-month high of $1.1715 set early in the week. New York Fed President William Dudley said on Wednesday an interest rate hike next month seemed less appropriate given the threat posed to the US economy by recent market turmoil. Traders said Dudley's relatively dovish tones, combined with upbeat data showing a big increase in US business investment plans have further helped soothe market nerves. A near-term focal point for investors is an annual conference in Jackson Hole, Wyoming, attended by many of the world's top central bankers. On Saturday, Fed Vice Chair Stanley Fischer will take part in the "US Inflation Developments" panel before the Federal Reserve Bank of Kansas City Economic Symposium in Jackson Hole. The market will be watching to see if the central bankers play down the recent market volatility as a headwind, analysts at DBS in Singapore said in a research note. "They will probably agree that the problem today is not in the advanced economies but the emerging economies," the DBS analysts said. "If so, the dollar index can regain some of its composure if the symposium succeeds in keeping expectations intact for a Fed hike later this year without more panic in the markets," they added. Against a basket of six major currencies, the dollar stood at 95.074, having recovered from a seven-month low of 92.621 set earlier this week. The dollar index is still down about 2% from last week's high of 97.078.